Watching interior design shows and browsing magazines may be inspiring – but they still don’t show you what to do in YOUR home. That’s why these online interior design classes are filled with expert tips and insider knowledge that will teach you exactly that. In fact, the video tutorials that you will have access to have been taken directly from our professional interior design training course. This Introduction to Interior Design Course is delivered over a 6-week period. When you enrol you’ll get immediate access to the first set of interior design classes through a membership area. Each of our interior design classes is jam-packed, fun and enjoyable - but trying to take too much at once can be overwhelming. So each week, a new set of classes for interior design will automatically be released into your membership area until you have access to all 6 series of interior design classes. Once you have access to the material online it will always be there for you to return to it whenever you wish. There is no restriction on time and you’ll pay just one fee for lifetime access. What’s more, because these classes for interior design are delivered as videos you can watch them as often as you like and you can fast forward or rewind if you missed something. You can’t do that in traditional interior design classes!!! You can't afford NOT to get this!!! if you enrol on one of our professional interior design courses (within 2 months of signing up for our introductory course) - we will discount the price of the professional course by the amount you have paid for the introduction course. Remember, you’ll have LIFETIME ACCESS for unbelievably low price of £97 / $147 PLUS a Full Money-Back Guarantee. You have nothing to lose and so much to gain. So what are you waiting for? 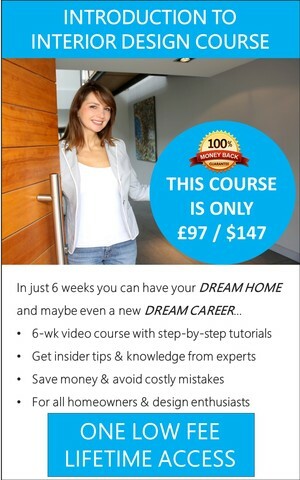 * If you want to achieve your designer dream home but don’t know where to start – THIS IS FOR YOU! * If you’re thinking about a career in Interior Design but unsure about online learning and want to test it out first – THIS IS FOR YOU! * If you simply love interior design and want to learn some of the insider tips and tricks – THIS IS FOR YOU!